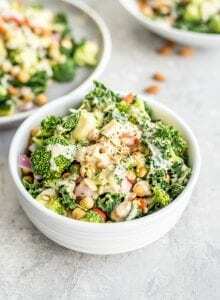 This crunchy chickpea salad is loaded with nutrition thanks to broccoli, zucchini, kale, red pepper, red onion and almonds. Bonus: you only need 20 minutes to make this simple but delicious vegan meal. De-stem the kale, cut into bite-sized pieces and place in a large bowl. Massage the kale with a tiny bit of olive oil (optional, can be oil-free) and lemon juice to soften it. Set aside for 5-10 minutes. Alternatively, you can very lightly steam it before adding to the salad. Drain and rinse the chickpeas and chop all the veggies and the almonds. To make the lemon tahini sauce, whisk all the ingredients together until smooth and creamy. Add a little water to adjust the consistency, if needed. Add everything to the bowl with the kale and mix well. Season with salt and pepper, if desired. Serve immediately or store in the fridge up to 4 days in a sealed container. If storing, you may want to keep the dressing separately until serving so the salad stays fresher. This makes 5 large meal-sized servings. Could serve 6-8 as a side.